As of August 1, 2018, Dr. Roxana L. Alvarez assumes the Office of the Director of the UB Central Farm Campus (UBCF). She replaces Dr. Gordon Holder, who has retired. Dr. Alvarez is a graduate of the Belize College of Agriculture, the forerunner to the UBCF and holds a Doctor of Veterinary Medicine Degree from the University of Granma in Cuba. She has been engaged in Teaching and Farming activities at the Tumul K’in Centre of Learning from 2003 to 2010. Most recently, she was the Manager of the Stann Creek Institute for Technical and Vocational Education and Training. 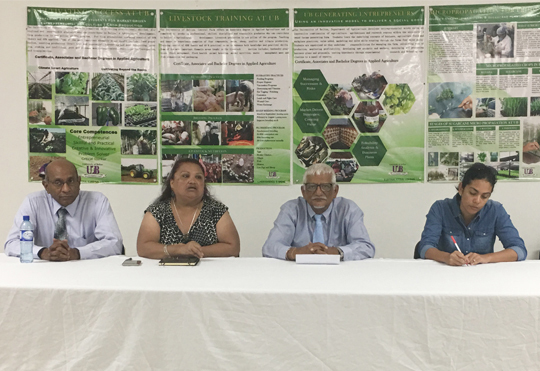 Yesterday, the President, the Vice President, and the Acting Director of UB Central Farm Campus, Mrs. Zoe Zetina, and the faculty and staff, welcomed the new Director of the Central Farm Campus of the University of Belize. The University of Belize as a whole welcomes her to our community.